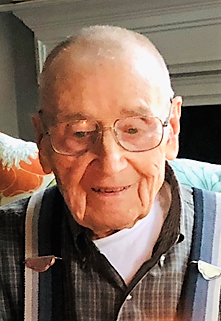 Harry Richard Fay, a resident of the Quad Cities for over 60 years and more recently Brookdale of Glen Ellyn, IL passed away Monday, January 14, 2019. He was 101 years young. Harry was born on August 24, 1917 in Windsor, IL. A WWII Army Air Corps veteran, he flew 51 bombing missions over Africa, Italy and much of Europe as a tail gunner in a B24 Liberator. He graduated from Bradley University in Peoria, IL then spent most of his career as a claims adjuster for Bituminous Casualty Company, retiring in 1981. Harry was an active member of the Republican Party as Precinct Committeeman and Rock Island Township Supervisor. He was an avid golfer and talented woodworker. He will be remembered for his dry humor, quick wit and poetry recitations as well as the many beautiful furniture pieces and toys made by his loving hands. Harry was preceded in death by Mary, his wife of 67 years and is survived by two daughters: Gracia (Will) McAllister and Beth (Rick) Quoss; five grandchildren: Andrew (Viju) McAllister, Sarah (Jake) Peters, Matthew Quoss, Adam Quoss and Elizabeth (Justin) Coghill and five great-grandsons: Sam & Tim Peters, Cash & Cross McAllister and Carson Coghill. A private memorial service will take place at the Rock Island Arsenal. Arrangements made by Leonard and Wheelan-Presley Funeral Homes. In honor of his memory, please pay it forward. Volunteer or donate to your favorite charity.